It's something everyone has to do at least once. Kitty is no different. 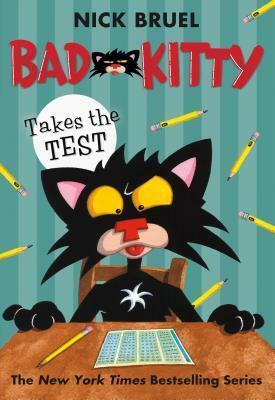 In this new edition of the beloved, bestselling Bad Kitty series, Bad Kitty faces . . . a test! Based on her previous bad behavior, the Society of Cat Aptitude has determined that Kitty is not only a bad kitty but a bad cat. In order to redeem her feline status, Kitty must take an aptitude test to determine if she deserves to be a cat. If she fails, she will no longer be able to be a cat. With the help of Chatty Kitty, who is the instructor at Cat School, and Uncle Murray, who thinks he's just there to renew his driver's license, Kitty learns all about being a cat and a little about herself. What a joy this book was. 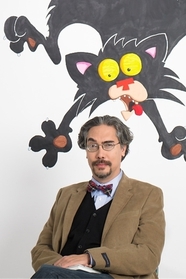 I am pretty sure I have said that with every Bad Kitty book I have read but Nick Bruel never fails to give us a fun book full of hilarity, facts, and at least one important lesson to be learned. I love the concept of Kitty getting her Cat License revoked for 'bad' cat behavior and having to go through the process of getting it back by taking a test. My girls obviously wouldn't get it but I had to chuckle at it all because it reminded me of having to sit though defensive driving class after getting a speeding ticket, (way back when and whoops) I also loved all the other little aspects that they may not yet catch on to as young children but that I loved and kept me entertained. The idea that there is a pencil company with plans to take over the 'world' though standardized testing, the lessons that standardized testing isn't beneficial to learning or proof of learning. The chickens, the girls and I may always side eye any chicken we come across from now on, Uncle Murray, poor fellow just can help but find himself in the thick of things every book, and Kitty herself who isn't really so bad but man the poor 'girl' just can't seem to catch a break. I mean what kitty doesn't love a game of hide and seek or tag with birds? There are just so many reasons to fall in love with Bad Kitty and I hope we'll continue to see more witty, hilarious, educational misadventures for this little cat and her 'friends'. I will make one note and that is, my oldest daughter who is 11 loves all the facts and information, but my 7 year old doesn't quite get it all. That doesn't change the younger child's enjoyment of the book at all but it DOES mean that whether you are 7, 11, or 42 (whistles) you can find something interesting and fun in this series! If you're readers love books like Dork Diaries, Diaries of a Wimpy Kid, or Terrible Two they will love Bad Kitty and teachers and parents will as well. I guarantee if nothing else, you will learn something you never knew in each book!